Desktop users on platforms that support the Google Chrome browser can share their screen by installing our Chrome extension. You will have the option of sharing your entire screen or just a browser tab. Like desktop screen sharing, your viewers will be able to view your shared browser window from any device with a web browser (including tablets and smartphones) without having to download or install any additional software. Use of the browser extension is subject to the terms of the Browser Extension License. The Screenleap extension is installed but has been disabled. Click the Options icon (icon with three lines) on the right side of the browser toolbar. Click on the Extensions option on the left side of the page. 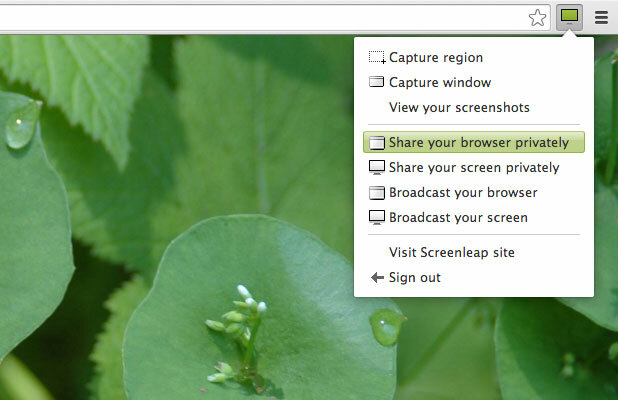 Check the Enabled checkbox for the Screenleap extension. When the window below appears, click "Add". Congratulations! The Screenleap extension has been successfully installed. Our browser extension works on Chromebook, so Chromebook users now have another option for sharing their browser windows. 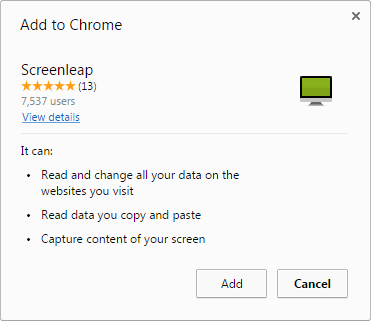 Unlike the existing options, Screenleap’s browser extension allows your viewers to view your shared browser window or screen without needing to install a plugin, or sign up for an account. We recommend that you have at least 4GB of RAM on your Chromebooks to ensure that you have adequate resources for screen sharing to function optimally and without issues. The browser extension works with less than that but you may run into issues if you have a lot of other tabs open while sharing. Browser extension users also have the ability to share their entire desktop or a specific window. To share your desktop, check the Share entire screen checkbox and then click either the Start Browser Share or Start Broadcast link. Once you confirm whether you want to share your entire desktop or just a specific window, your sharing will begin. Chrome users can take advantage of our integration with Gmail. If you have our browser extension installed, you will see two new buttons in your compose window. You can click the screen button to start a desktop share and the window icon to start a browser share. Once your share starts, we will automatically insert the share link into your email message so you can send it to your viewers. Chrome users can take advantage of our integration with Slack. If you have our browser extension installed, you will be able to start a screen share from within Slack by typing the /leap command into the input box. Learn more about the Slack Integration. Share your browser privately - Share your browser window that is viewable by going to a unique URL or entering a unique 9-digit number. Share your screen privately - Share your screen that is viewable by going to a unique URL or entering a unique 9-digit number. Broadcast your browser - Share your browser window that is viewable by going to your handle page. Broadcast your screen - Share your screen that is viewable by going to your handle page. If you have not already signed in to the extension, you will be asked to sign in. You should only have to do this once. If you do not yet have a Screenleap account, click "Don't have an account?" to quickly make a Free account. Each time you start a browser share you will be shown instructions telling you how to give other people access to your browser share. You can tell your viewers the displayed share code over the phone or send them a link that they can click on. While you are sharing, A green border will appear around the web page that is being shared. If you switch between tabs, the green rectangle will move to the new shared tab. 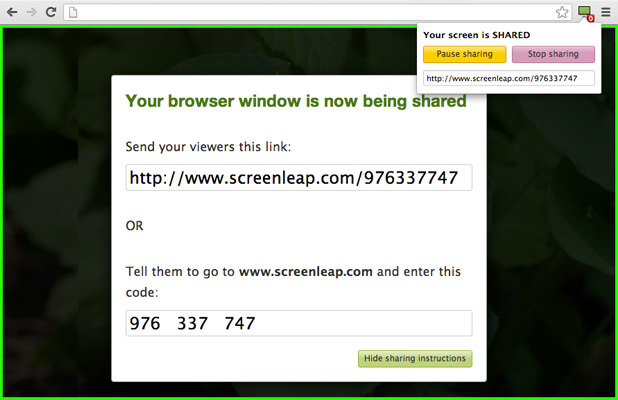 The Screenleap extension button will show you the number of people viewing your browser share. If there is no number displayed, it means that your browser is not being shared. You can control your browser share from the console. To open the console, click on the Screenleap extension button. From the console, you can pause and stop sharing. You can also click the link button to the left of the pause button to view the sharing instructions again. Multiple monitors are only supported if they all have the same device pixel ratios. For example, all the monitors need to be retina/HiDPI or they all need to be normal DPI monitors. When you are sharing your browser window, your mouse cursor will only update if your Chrome window is the active window. If you click to another app and don't click back on the Chrome window, your viewers will not see your mouse movement even if you move it over the browser window. When you are sharing your browser window, your mouse cursor will only update if your mouse cursor is not over an iframe. When you are sharing your browser window, the available options will not be visible to your viewers when you click on a select form element.